Now this was a fun card to produce. I bought a big pack of Christmas ornaments and smashed them. 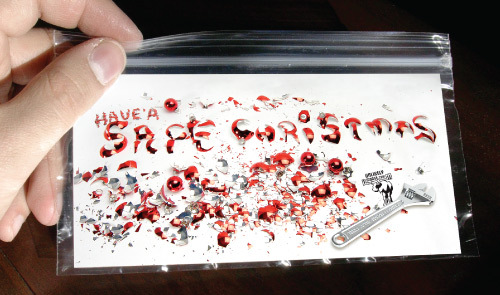 The resulting pieces spelled, “Have a safe Christmas”. A teaser on my website led up to the mailing of the cards. First a photo of the pack of pre-smashed ornaments was shown with a tag asking, “What will this year’s christmas card be?”. The day the cards were mailed a new image appeared on my website simply showing a wrench with the message stating that the cards have been mailed.